I know it doesn’t feel like fall yet outside, but I’m ready to start baking apple and pumpkin everything! =) I started with this apple pie, and it was a winner! 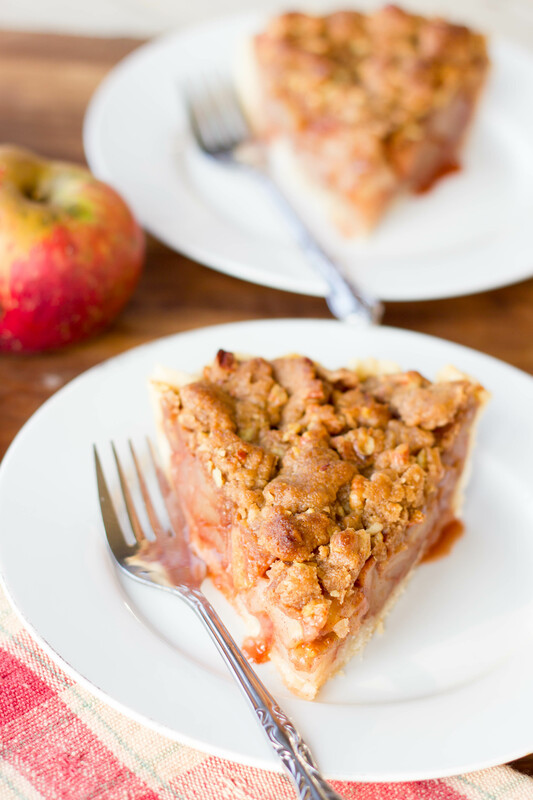 I have a favorite apple pie recipe already – my grandma’s classic double crusted apple pie – and it’s seriously the best apple pie ever! And I don’t throw “best ever” out there lightly! The thing about having a food blog is that you can’t make the same things over and over. Well, I mean you can make them, obviously, but you can’t really blog your favorite apple pie twice ;). So, I branched out a little and combined my favorite apple pie filling with a buttery-cinnamon-pecan crumble. 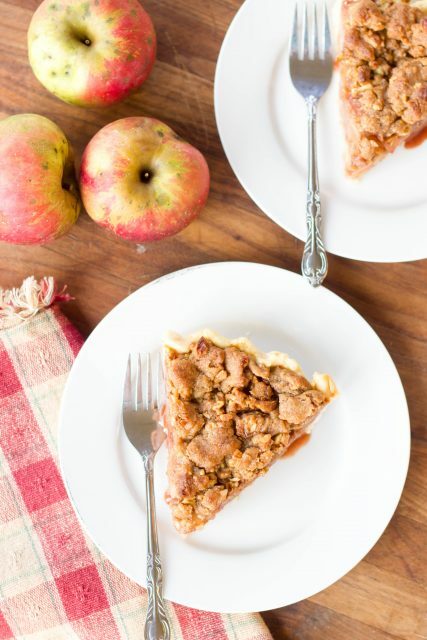 Is it now my new favorite apple pie? 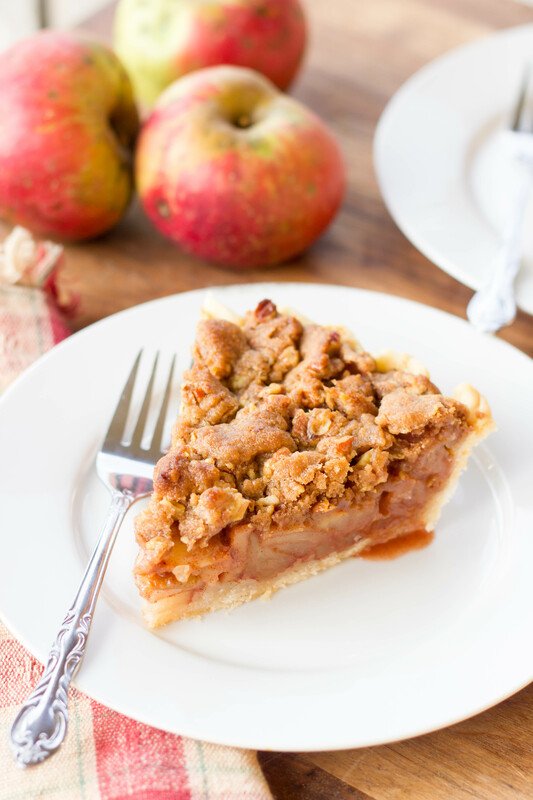 I don’t know if I’d go that far, but if you love apple pie and apple crisp/crumble you will LOVE this pie! Bake it this weekend and let me know if you love it as much as I did! Enjoy! 1. In large bowl, combine apples, sugar, cinnamon, and vanilla. Set aside as the oven preheats to allow the apple to start letting off their juices. 2.Preheat oven to 400 degrees. Place crust in 9 inch pie plate. 3. In medium bowl, combine the brown sugar, cinnamon, flour, salt, and pecans. Add melted butter and stir until combined – it will be thick and crumbly. 4. 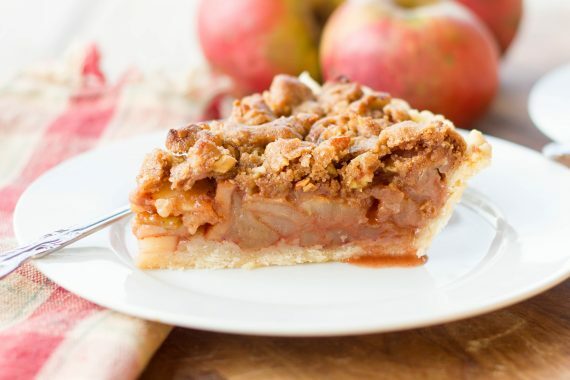 Pour apples into prepared crust. Top with crumble mixture. 5. Bake in preheated oven for 10 minutes. Reduce oven temperature to 350 and continue to bake for 45-50 minutes or until top is golden brown and filling is bubbly. If top starts to brown too quickly, cover with aluminum foil.